'And the Oscar for best original score for a motion picture goes to Close Encounters of the Third Kind, nope, I lied, it's Star Wars.' Well it could have happened that way (I don't know, I wasn't born at the time). Close Encounters would probably have been yet another statue in John Williams' already stuffed statue cupboard (if composers have such a thing). This edition of Close Encounters is much more difficult to review than the original since that only had a few tracks and so it was easier to see how it all fitted together as an album. This latest edition, with vastly improved sound as well as a larger selection can now be classed as the definitive edition. The start is an inspired 48 seconds that build from quiet, eerie strings into full orchestral hit, quite marvellous. A lot of the score plays like a horror score and Williams certainly manages to extort some very eerie and frightening musical effects, especially in tracks such as Barry's Kidnapping where the overall effect of skittering strings as well as peculiar choral effects is really quite malevolent. However, not all the alien encounters are as terrifying, there are moments when the effect is much more magical and indeed pre-empts the material from closer to the end. As well as the early alien encounters are the X-Files style cover-up sections which include a clipped Goldsmithian military theme that appears most prominently in Stars and Trucks. It is perhaps the ending that Close Encounters is so justly famous. The 5 note calling theme is explained in terms of its origin in the interview in the liner notes and is one of many highly recognised Williams themes. It doesn't appear in full until near the end, but is introduced fully in the conversation track where the humans use the theme to contact the alien visitors. The ingenious use of a tuba to speak to the Mothership certainly gives it a great character of its own. The use of When You Wish Upon a Star is also very clever indeed and strangely doesn't seem at odds with the rest of the music at all. Its use in the end credits might seem strange, but it really works very well with a small hint of the five note theme in the choir as the Mothership disappears back from whence she came. 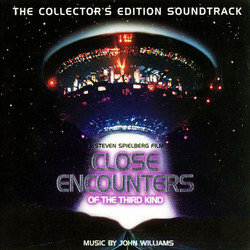 This is possibly the most complex of the Spielberg-Williams films and scores because of all the elements involved and the fact that they are so disparate in nature, the magical, the impressive, the scary, the sinister, there is just such a variety of things going on that makes the score even more impressive than you might have imagined. Of course, not everyone will appreciate it in quite the same way as Raiders of the Lost Ark or one of Williams' other action scores, but it is absolutely worth checking out and worth persevering with. The liner notes are interesting and appear to feature a brand new interview with the maestro discussing some of his musical choices and makes for insightful reading. A CD that deserves a space on anyone's shelf.